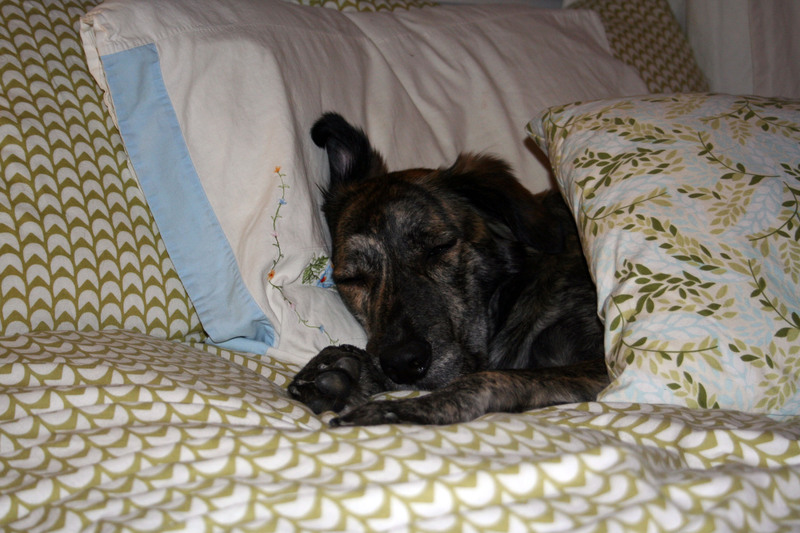 I AM VERY TIRED TODAY – Princess Pekoe's Adventures! IT HAS LOTS OF CUSHIONS AND IS REALLY BIG AND HAS A TEDDY BEAR. I DON'T HAVE A TEDDY BEAR BECAUSE I EAT THEM. I AM VERY, VERY SLEEPY BECAUSE OF WEDNESDAY AT THE PARK WITH GINNY AND TODAY ALL THE WAY TO METROTOWN AND THE PARK BUT I WANT TO SHOW YOU MY FAVOURITE MOVIE. THIS IS FROM MY VERY FIRST OUTING TO THE BEACH WHERE I WAS ALLOWED OFF MY LEASH WITH OTHER DOGS. IT WAS GREAT AND THERE WERE LOTS AND LOTS OF OTHER DOGS AND THEY WERE SWIMMING IN THE OCEAN SO I FOLLOWED THEM BUT I RAN INTO THE WATER AND IT WAS REALLY COLD SO I DO NOT GO IN THE OCEAN ANYMORE. AUNTIE MAELIE MADE ME A MUSIC VIDEO BECAUSE I AM A ROCK STAR. I LIKE AUNTIE MAELIE BECAUSE SHE DRAWS PRETTY PICTURES AND STEALS ME FOR WALKS ON THE BEACH. ALSO SHE TELLS ME IT’S OKAY TO DO BAD THINGS SOMETIMES. SHE IS MY FAVOURITE AUNTIE EXCEPT FOR ALSO AUNTIE ARI AND AUNTIE HAILEE AND AUNTIE KIM AND AUNTIE KILEY AND EVERYBODY ELSE. MUMMY AND AUNTIE ARI WATCHED A MOVIE YESTERDAY THAT TALKED ABOUT DOGS AND PEOPLE BEING FRIENDS AND HOW IT IS VERY IMPORTANT AND SPECIAL (YOU CAN WATCH IT HERE) AND IT HAD A DOG WHO KNEW 300 WORDS. I THINK I ONLY KNOW ABOUT 30 WORDS BUT TODAY WE WERE PRACTICING MY VOCABULARY (I THINK IT MEANS WORDS) SO I LEARNED TO GO GET MY FUZZY YELLOW BALL WHEN MUMMY AND AUNTIE ARI TELL ME TO. I CAN NOW GO FIND MY FUZZY YELLOW BALL EVEN WHEN IT IS SOMEWHERE ELSE, LIKE AT THE END OF THE HALLWAY OR IN THE KITCHEN OR ON THE OTHER SIDE OF THE COUCH (EXCEPT WHEN I AM TIRED OR THERE IS SOMETHING MORE IMPORTANT TO LOOK AT). MUMMY SAID I WAS VERY SMART AND I GOT LOTS OF TREATS. I DON’T UNDERSTAND WHY THIS IS SUCH A BIG DEAL BUT THE TREATS WERE GOOD. I TRIED TO GET MORE TREATS LATER BY DROPPING MY RED BOUNCY HOLLOW BALL ON AUNTIE ARI’S FOOT BUT SHE SAID “NICE TRY BUT I’M NOT FALLING FOR IT.” I DON’T KNOW WHAT THAT MEANS EITHER BUT SHE DIDN’T GIVE ME ANY TREATS THAT TIME. EXCEPT FOR PLAYING WITH MY BALL MUMMY AND AUNTIE ARI ARE REALLY BUSY TODAY DOING SOMETHING ON THE INTERNETS THAT I DON’T UNDERSTAND. THERE IS A LOT OF MUTTERING AND BAD WORDS THOUGH. I AM PRETTY SURE THAT SOON THEY WILL BE DONE THE BOOKSLINGERS PAGE AND THEN EVERYBODY WILL BE HAPPIER.